Thank you to the community members and health service providers, who gave us their time to participate in our recent engagements. In June 2018, Council commenced a ‘Health Service Mapping’ project for Golden Plains Shire (GPS) which involved collaborating with both ‘Health Service Providers’ in the Shire and community members. The purpose of this project was to better understand how health services are currently being used in Golden Plains. A big thank you to all community members and health service providers who gave us their time to participate in our engagements. Your contribution will assist us to identify opportunities to strengthen future health service delivery in the Shire, and will direct future partnership and advocacy opportunities. 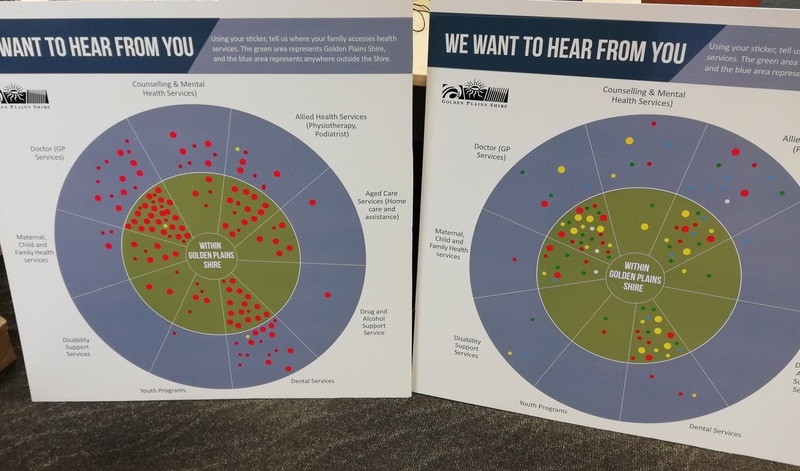 Over a three month community consultation period (August 2018 to October 2018), over 160 community members completed a ‘Community Health Service Survey’ (95 electronic, 65 hard copies), and 93 community members provided input through two conversation posts, and engagement boards which rotated across the Shire. (see image below). Information provided by community members is currently being analysed and will be shared in the form of a ‘Community Health Service’ summary document’ which will be uploaded to this page in early 2019. Furthermore, in July 2018 we heard from 27 health service providers who responded to our ‘Health Service Provider Survey’. Respondents have since been provided with a short summary report capturing key findings. Council is currently in the process of analysing information provided by community members and this will be summarised in the form of a ‘Community Health Service summary document’. This resource will be uploaded for community members here on our ‘Have Your Say’ page in early 2019. Council is also in the process of developing a ‘Golden Plains Health Service Directory’ using information provided by health services providers and existing service directories. This resource will provide a visual snapshot for community members informing them of the range of health services available in the Shire. Once developed, this resource will be printed and made available to community members. For more information please direct correspondence to chloe.mckenzie@gplains.vic.gov.au.